I attended a fascinating lecture the other night: “The Dictionary as Data: An Alumni Talk with Peter Sokolowski.” The talk was not only impressive, it was also a bit of serendipity for me as I had just finished a wonderful book, The Story of Ain’t written by David Skinner. So said the editor in chief of Webster’s Second Edition. But, as it turns out, dictionaries are also a window into our psyches. Regardless of whether one looks at how dictionaries are used, or how they are made, the window is indisputably wide open. “It is ironic,” Gove said, “that the very title of the book we are considering contains a series of words which almost defy definition. It starts with the word Webster, about which there seems to be considerable doubt. The exact meaning of the word New is anyone’s guess. The word International has never been clearly defined. We are not even sure of the precise definition of the word dictionary. And the word English is open to considerable discussion. The word language has had a multitude of interpretations, and, finally, it is almost impossible to define precisely the word Unabridged” (171-72). Let the fun begin! Both Sokolowski’s lecture and Skinner’s book concern Merriam-Webster dictionaries. The Story of Ain’t is about the making of Webster’s Third edition in the early 1960’s. The overblown and manufactured-by-journalistic-laziness controversy over the eponymous word wonderfully describes the cultural history of the era, and with fascinating symmetry, reinforces the crux of the theme of Sokolowski’s lecture: dictionaries chronicle the culture. The words that we define and codify reveal who we are at any given moment. Even the manner in which we go about defining and codifying, as Skinner shows, communicates a zeitgeist. “From its tendentious title- the work being neither Webster’s nor international, and only now and then a dictionary- to its silly systems and petty pedantries, the book is a faithful record of our emotional weaknesses and intellectual disarray” (Jacques Barzun quoted 293). Skinner fully appreciates the high level of sophistication insults and condensations can reach in the ‘educated class’, and entertains the reader with one example after another. The comprehensive manner in which he uses the process and people involved with the making of the Third Edition to illustrate the culture of the time is skillfully executed and makes for a very fun read. Peter Sokolowski, word maven and editor of Merriam-Webster turned the focus outward in his talk, examining the data that is currently being culled from online users of dictionaries. The trends are stark and fascinating: reflecting enduring conundrums (the etymology of “conundrum” is really fun, by the way) such as “effect” and “affect;” or a sudden interest in an obscure word mentioned by a newscaster or sports reporter. But there are also pairs of words that move up or down the ‘most looked up’ graph in concert with surprising constancy, or categories of words that occur in reliable order after cataclysmic events. The potential to glean sociological information from, of all things, dictionary data bases is astonishing, if slightly dismaying. The interplay between our spoken language and the words that are then committed to writing is complex, illuminating, and meaningful. 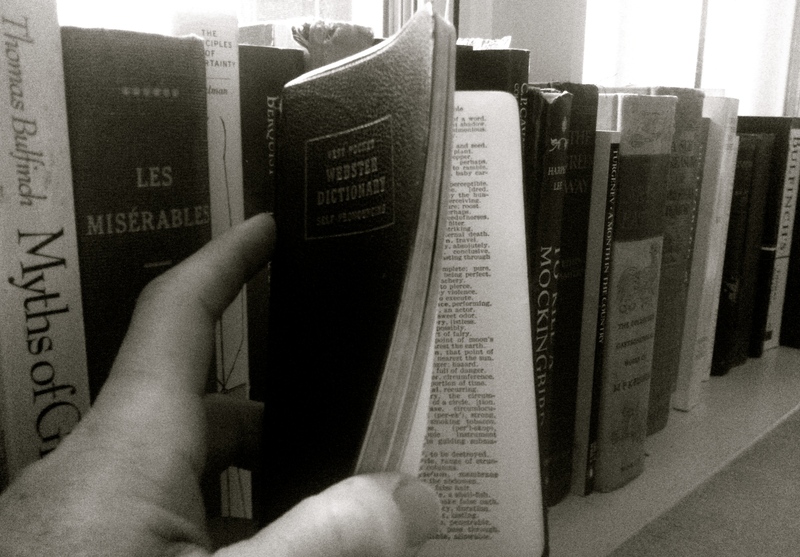 Dictionaries are used for all sorts of reasons: informational, instructional, etymological, philosophical (love, Sokolowski told us, for instance, is word that is looked up with curious relentlessness, considering its ubiquity). The potential insight provided by a digital platform’s newfound ability to uncover our relationship to words and what our language usage says about us is exciting, however, I must admit, I am somewhat nonplussed over my own inadvertent exposure. *title from pg 193: Twaddle knew the letter writer,[…] and confirmed that he was a sane person whose views should be respectively heard. “There is nothing long-haired or wild about [him],” he said. **Best Latin phrase ever – viva adhuc et desiderio pulcriora – living still and more beautiful because of our desire.